KYZEN’s North American Operations Facility allows for support of our customers in the northern United States and Canada including; manufacturing, experienced technical support, unmatched engineering services, and an award winning Applications Laboratory equipped for additional customer process qualification and contract cleaning. Exiting the airport follow the sign for “101 to 93”. At the light, make a right onto Brown Ave. going North. When reaching I-293, go West over the Merrimac river. Stay to RIGHT as I-293 bears right. Stay on I-293 to Exit #5 – Granite Street. Take this exit to end of ramp traffic light and make a RIGHT onto Granite Street. Go over the river to the first traffic light. Make a left hand at this traffic light onto Commercial street (KYZEN’s street). Proceed on Commercial Street until you pass under a large bridge. After passing under this large bridge, we are in the second building on the left. 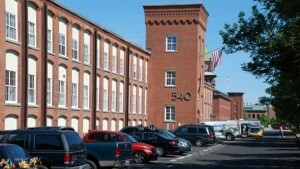 You will see #540 on the tower (of a former mill-type building). Park in KYZEN parking space to the left of this tower (It will have a KYZEN visitor sign) and use the door in the left entrance. Go down the stairs and you will see the KYZEN door on the left.